A Russian Soyuz Rocket and TMA-13M spacecraft are raised atop a launch pad at Baikonur Cosmodrome in Kazakhstan to launch the new Expedition 40/41 crew of the International Space Station on May 28, 2014. Three new crewmembers are set to launch on a quick trip to the International Space Station, and you can watch them blast off live online today (May 28). 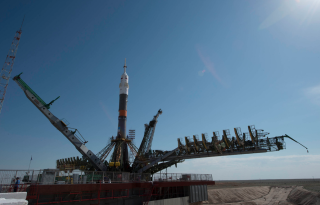 NASA astronaut Reid Wiseman, European Space Agency astronaut Alexander Gerst and cosmonaut Maxim Suraev are scheduled to launch on their Russian Soyuz spacecraft from the Baikonur Cosmodrome in the Central Asian nation of Kazakhstan at 3:57 p.m. EDT (1957 GMT). It will be the wee hours of Wednesday (May 29) in Baikonur. You can watch the launch webcast live on Space.com beginning at 3 p.m. EDT (1900 GMT) via NASA TV. "On this day, if all goes well, we will experience for the first time, how living space really is," German astronaut Gerst wrote in an ESA blog posted on Tuesday (May 27). "Many of the activities we need to do in zero-gravity on the first day, none of us could ever be trained for: how do you move elegantly through a tangle of cables and fragile devices when no up or down exists? What is the best technique to successfully go to the toilet?" The three new crewmembers will join NASA's Steve Swanson and cosmonauts Alexander Skvortsov and Oleg Artemyev on the orbiting outpost, bringing the International Space Station up to its usual capacity of six spaceflyers. "I got a list of about 20 things," Wiseman told Space.com in a video interview before his launch. "Most of them were actually pretty funny. Someone wanted me to play a Quidditch match. There are some other people who want you to just take a picture of your face every day so that you can see what happens with fluid shift as your face gets full of all your fluid. I already made a matrix of this bucket list and I want to just start checking it off one step at a time. Some of it will be looking out the window and some of it will be doing some interesting things, and I'm sure there will be some things added to the bucket list as time goes on."